I've said it before but Marvel UK STILL has the capacity to take me by surprise. Every time I think I've pretty-much got a handle on all their adventure output, I stumble across something new. This is a house ad for M.A.N.T.A FORCE WINTER SPECIAL 1989 which I recently stumbled across. I knew that IPC had run a MF strip in the pages of the EAGLE but I had no idea that M-UK had subsequently picked-up the license, from Bluebird Toys, for this one-shot. I've certainly never seen a copy. The toy line itself (which I never owned although I have a vague memory of seeing adverts on TV-am) was a series of multi-function space vessels with mini-figure crew. 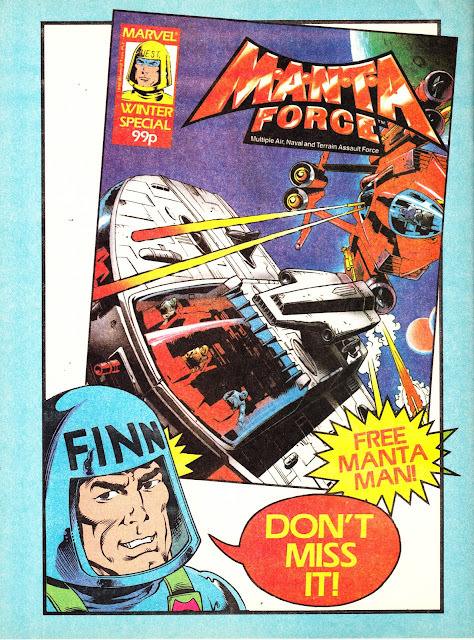 One of which, a "Manta Man", was presumably given away with this one-shot. I recently found and purchased a copy! it extremely hard to get your hands on one! Anyway, it doesn't look like it was meant to be an on-going series! It contains one of the stories from one of the 2 Manta Force books, including some of the illustrations. It's also contains the first story from the Eagle Comic run. It's a weird one really. Nothing original, just kinda rehashing what was already available. I run the Manta Force wiki, if you would like to check it out!